It’s not exactly the meatloaf you grew up eating. 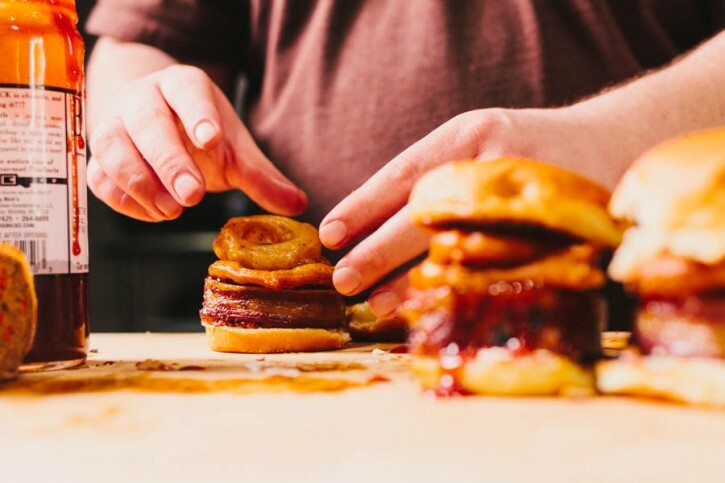 It’s wrapped in bacon, cuddled up to cream cheese and beer battered onion rings and kissed with chipotle ketchup, all before getting a bear hug from a sweet slider bun. I don’t want to say it’s better than what your Mom made you as a kid, but it is. Onion. Ring. Magic. 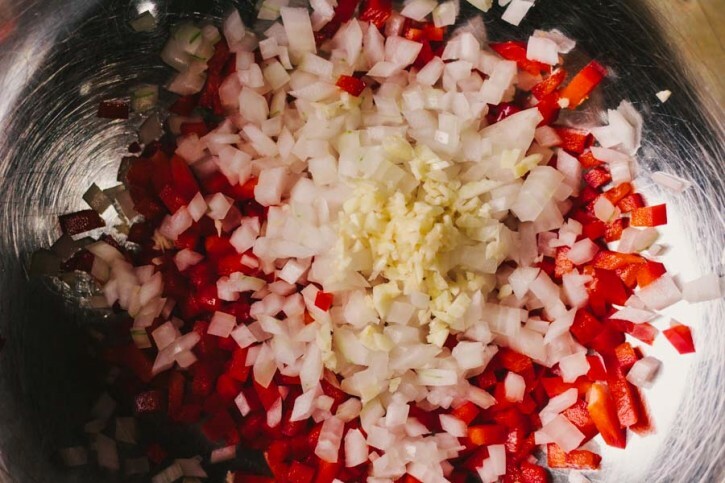 Brining your onions before battering and frying them will ensure you never have a bland onion ring again! This meatloaf isn’t cooked in a pan. 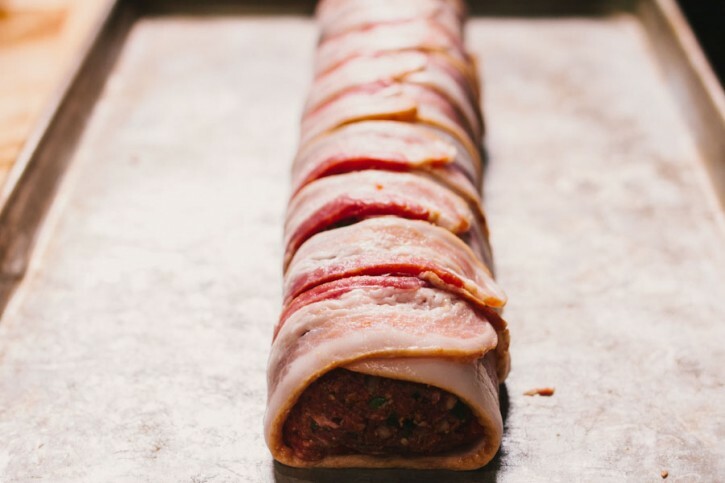 By forming the loaf into a cylinder, all we have to do to make sliders is slice along the bacon strips. We also have the added bonus of the smoke fully surrounding the meat for maximum flavor. 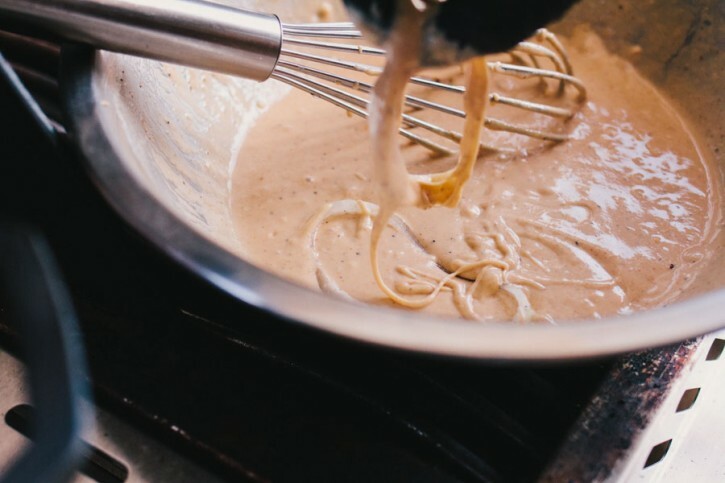 A simple mixture of beer, flour and seasoning makes a great beer batter. You can do this on your stove top, the side burner of your grill or even in the smoker. The key is monitoring the temperature of the oil (which can be done with a digital thermometer) and maintaining that temperature. Preheat your Yoder Smokers YS640 to 375ºF, set up for smoking/indirect cooking. Fill an A-MAZE-N Tube Smoker with your favorite pellets. Place on the lower cooking grate, to the left side. Light with a torch. 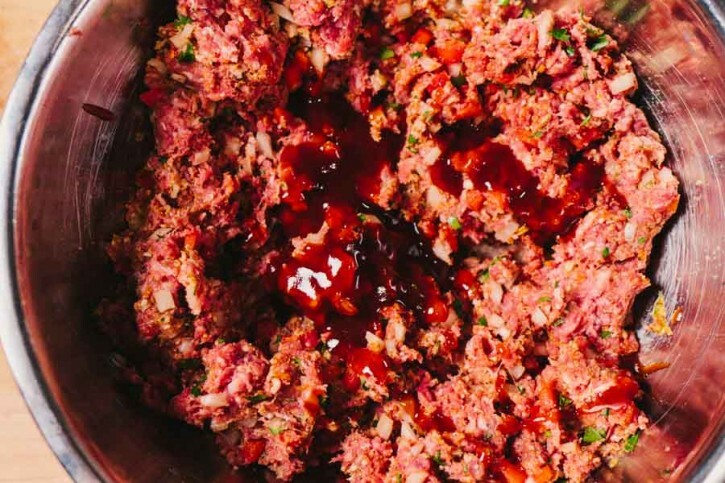 To make the meatloaf, combine all ingredients, except the bacon slices, and mix well until the mixture is tacky. Roll the meat mixture into a log, about the diameter of the slider buns. Layout your bacon slices side by side. 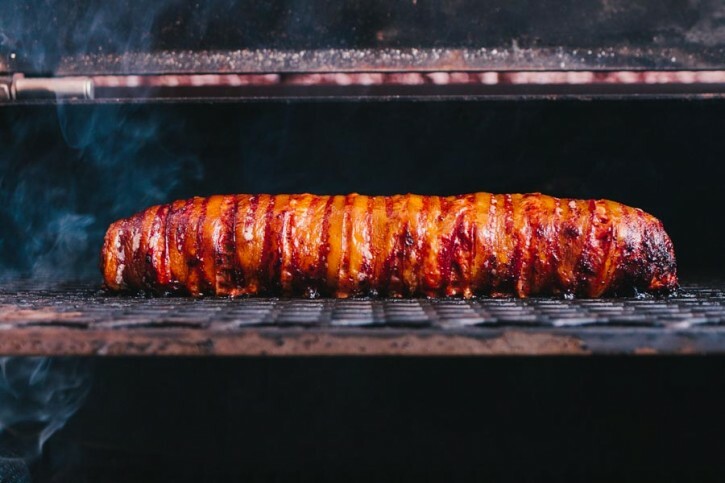 Place the meatloaf log on the bacon and roll the log, wrapping it in the bacon. Transfer to the second shelf of the cooker. Grill until the internal temperature reaches 160ºF, about 45 minutes. Remove from the cooker and rest. 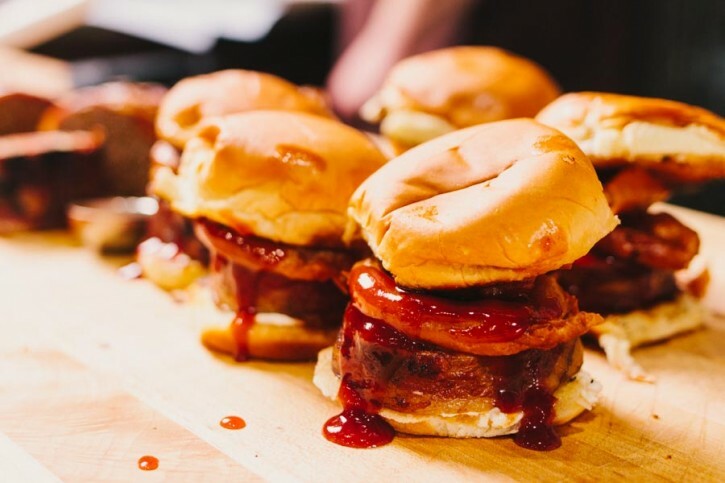 Slice sliders (about the width of a half slice of bacon). Prepare your frying oil. Fill a Lodge Logic 7 quart dutch oven about half full of vegetable oil. Heat over medium high heat, until an instant read thermometer inserted in the oil reads 375ºF. Reduce the heat to maintain that temperature. 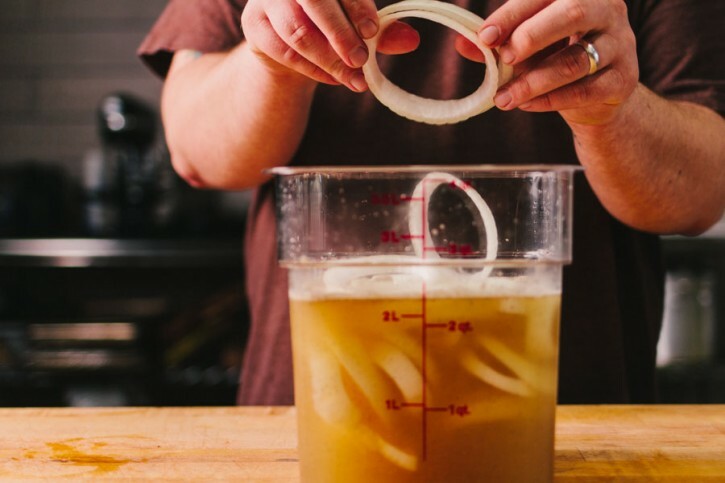 To make the onion rings, combine the flour, beer, water and Jack Stack French Fry Seasoning. Mix well. 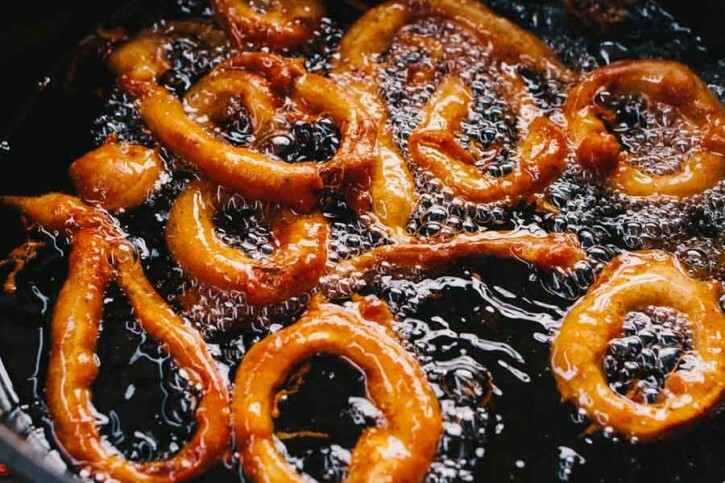 Toss the onion rings in the batter, then transfer to the hot oil, one at a time. Fry the rings for about four minutes on each side, or until light golden brown. Remove for the oil with a slotted spoon and transfer to paper towels. To build your sliders, spread the bottom slider bun with cream cheese. Place the meatloaf slider on top, then a couple of onion rings. Smother everything in Big Rick’s Chipotle Ketchup and add the top bun.